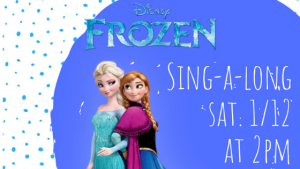 Join Miss Alex for a Frozen Sing-a-long & a Frozen Craft! Costumes encouraged! Space & supplies limited. Registration encouraged, but not required! Registration opens December 1st. *Contact Children’s Librarian Alex Klaus at aklaus@durhamlibrary.org.